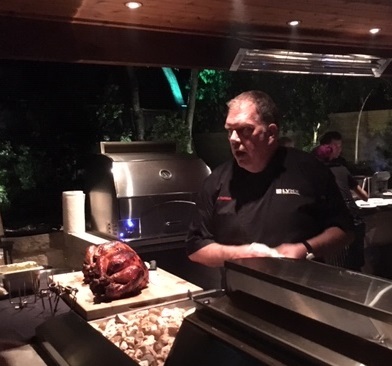 If you think of a backyard barbecue as nothing but burgers and brats, famed chef Kent Rathbun could teach you a thing or two! Long before they were marketing partners, Rathbun discovered a favorite grill product in Lynx Grills. His outdoor kitchen is a sight to be seen, and full of wonderful surprises. Rathbun recently hosted friends and fans of Lynx grills to show the amazing things that can be accomplished outdoors with great experience. Rathbun describes Lynx as the Porsche of grilling equipment – and I’d LOVE to take a test drive. Rathbun proved you could create any event – from a glam dinner party to even Thanksgiving dinner – all using outdoor equipment from Lynx. The chef started the evening not grilling, but smoking. The amazing high tech smoker was Bluetooth enabled and featured a one of a kind smoke delivery system. 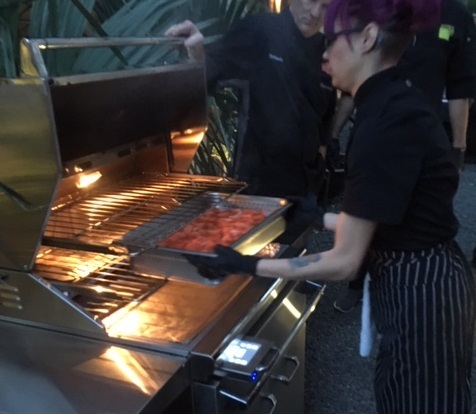 Guests loved the tangy, glazed smoked salmon bites that were perfectly smoked without losing the fresh fish flavor. You may not think about BAKING outdoors, but Rathbun showed his skills with tasty mini chicken biscuits. The biscuits, baked in Rathbun’s outdoor oven, were perfectly flaky and the chicken was tender and not overcooked. The courses continued to come all night– perfectly grilled New York strip steaks, a perfec trotisserie turkey, short ribs and more. Then, chef really surprised. He closed the evening with a batch of warm, gooey cinnamon rolls baked in his Lynx Napoli outdoor oven. Other than a happy belly, the main takeaway was this – equipment matters. And Lynx creates a breadth of product and function that is virtually unrivalled in the industry!